1) You have an earlier Mac that doesn’t have an Airport Extreme card (AEC). 2) Your current AEC only supports 802.11b or 802.11g protocols (MAX includes 802.11n support) and you want the speed 802.11n provides. 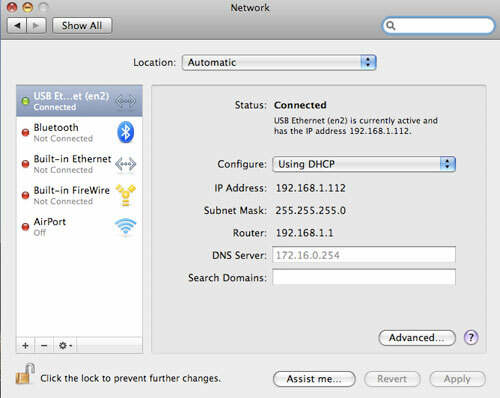 3) The network you want to connect with has a weak signal (You get up to 4x greater range with the “n” protocol). 4) The card in your current Mac is not working. I was interested in trying the MAX because I have a network I want to connect with that has a weak signal. 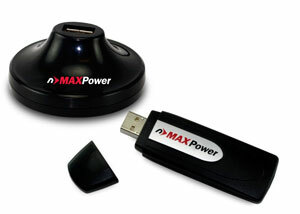 The MAXPower package consists of the MaxPower USB adapter, an installation and driver CD, an extension cradle, and user manual. Installing the drivers was an easy process. The MAX comes with drivers for Mac OS 10.3 and an additional set of drivers if you are running Mac OS 10.4 or 10.5. Installing the driver and the software was simple. 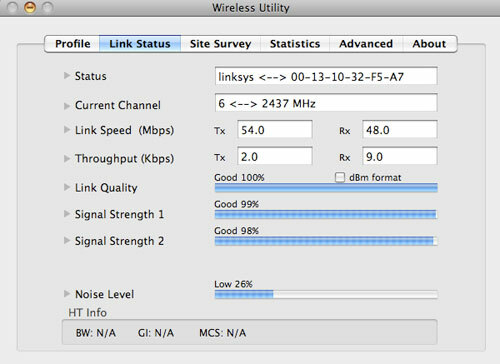 Additionally, you’ll need to set up the MAX in your network prefs. The manual does a good job of walking you through the configuration. Once everything is configured, run the USB Wireless Utility that was installed on your hard drive and you are off and running. 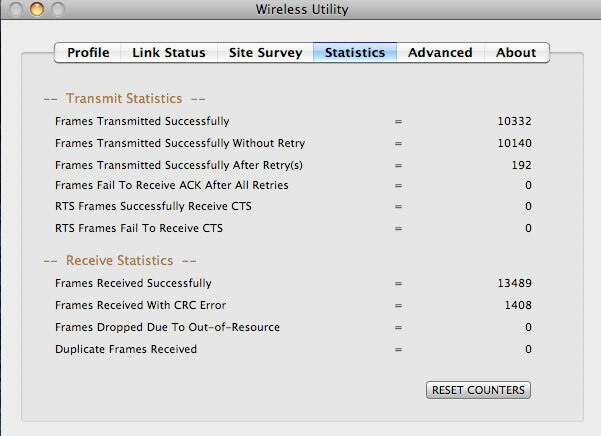 The utility program provides quite a bit of information about your connection. 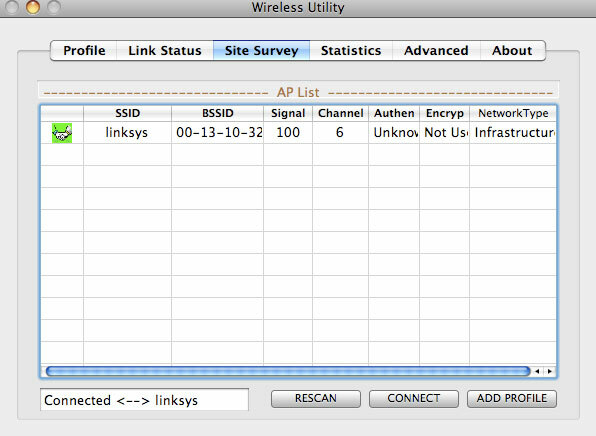 Under the advanced tab, there is a drop down box that you can use to pick your network speed. So, how did it work?? I had good results using MAX. My town offers free wi-fi when you are in the downtown area. I’ve had a problem connecting downtown with my MacBook for a while now. I didn’t have any problems in the past at my favorite sandwich shop where I was regularly connecting, but suddenly, I did. I just could not get a signal, or it was so weak I could not connect, but I can get a signal in other places around town. This time I went downtown armed with my MacBook and the MAX. I went into my favorite shop, fired up the MacBook and plugged in the MAX. At first, I was only able to get a weak signal. It was a bit stronger than using my internal AEC but it still wasn’t strong enough to make a good connection. Then I had an idea. Why not use the extension cradle? I unplugged the MAX from my USB port and plugged it into the extension cradle. Using the extension cradle was like using an old TV antenna. I was able to move it around until I was getting a good signal. After that, I was able to get a much stronger signal, connect to the web and get email. I was not able to connect with just my internal AEC in the MacBook. The other good thing about the MAX is the software. Using the “Activity” tab gave me all kinds of good stats about my connection. I was able to use that data to position the cradle for the best reception. I wish the MAX had more detailed instructions about the driver software. There are many settings and reading that I simply do not know what they mean, or what they would do if turned on or off. I marked the unit down a bit because of this. Inexperienced users will be able to get the unit up and running using the default settings. Otherwise, this is a fine addition for the reasons mentioned above. At some point, I’m sure I will upgrade my home network to the 802.11n protocol and thanks to the MAX, I’ll be ready to use the higher speed with my MacBook.